A synopsis of Eggs for the Hunting by Reg Down - an Easter story. Includes the book cover, age suitability, reviews and a link to sample chapters and stories. Spring is full of life and life is full of eggs, all sorts of eggs: great cosmic eggs and tiny butterfly eggs, salmon eggs and bird eggs, rabbit eggs and special eggs being gilded and painted by two gnomes called Pine Cone and Pepper Pot. They have been told (gossiped, to be correct) that Farmer John’s children, Tom and June, are going to give them special eggs for Easter, and they decide to reciprocate. However, if you are a gnome, a small gnome—even if you are two small gnomes—then the simplest of tasks (such as finding a bird who does not mind giving you a couple of their eggs) can be a problem ... !!! Woven into the fabric of the book are many tales, myths and legends: Pepper Pot reads the history of King Karnac and the Turning of Time, Madam Two-Pecks tells her chicks how the universe was created from the World Egg, and the Wise Salmon in Running River tells the fingerlings about the great cycle, the Egg of Life. 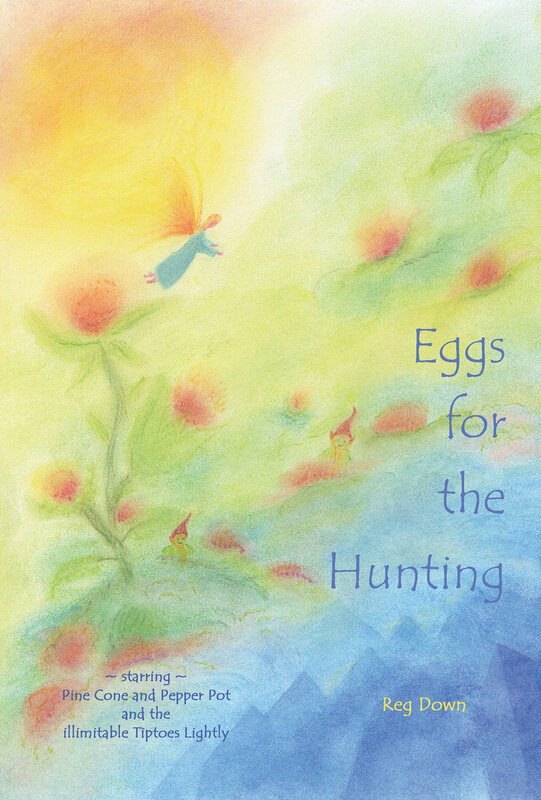 Eggs for the Hunting is a spring tale, a wonder tale, affirming the joy, humor and mystery of life.